Audyssey room correction is included in many of the most popular AV-receivers. By making adjustments to reduce the effects from bad room acoustics or bad speakers, Audyssey improves sound quality. And even for good systems in good rooms there may be a significant gain in clarity and definition of the sound. However, limitations to the Audyssey implementations causes failure when used with some speaker and room combinations. I will show what goes wrong, and how to make it work. This system consist of controlled directivity main front speakers and 4 compact Horn subwoofers located in the corners. Distance, level and crossover settings are carefully calibrated, to give a reasonable flat tilted frequency response and volume level calibration according to 85dB SPL for -20dB master volume. After running Audyssey the tonal balance is too bright, with excessive highs. Selecting the 'Audyssey' curve only makes it worse, it ends up with a notch in the upper midrange, too bright, and the highest frequencies attenuated. Also, the automatic settings for subwoofer crossover and distance is far off, causing the bass to be very strange. All this can be confirmed by measuring the systems frequency response - which shows the loudness as a function of sound frequency. Because Audyssey internally uses a different method to find the response it uses to calculate the correction, the result will vary depending on the speaker and room interaction. For some speakers and rooms it may work, for others, not so. The red curve is the calibrated system without Audyssey, a fairly even response with a slight downwards tilt as the frequency rises. The grey curve is with Audyssey Flat correction enabled, and all settings left like the automatic calibration suggested. There are severe dips in the bass range, and level above 2-3KHz is too high, causing a too bright sound balance. These curves are not smooth, they show peaks and dips caused by room reflections. They are presented like this, with 1/24 octave smoothing only, so that we can see what is going on. By restoring settings for subwoofer crossover and distance and level, the bass response is restored. Crossover is set to 120Hz, distance is 5.40m. 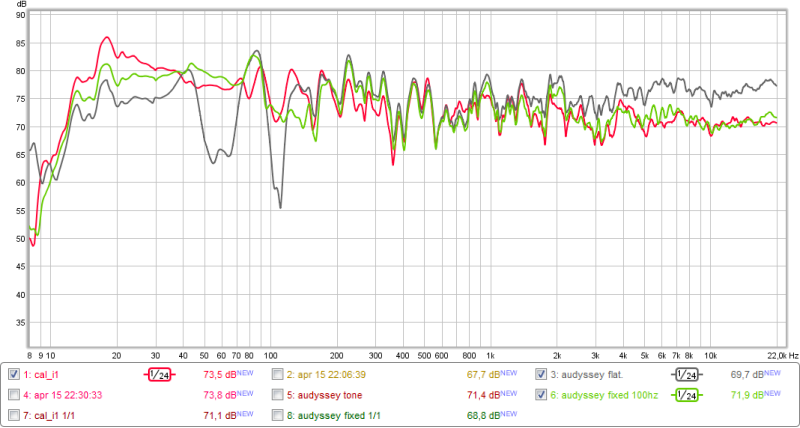 The green curve is Audyssey Flat with tone control adjusted and crossover and distance settings restored. 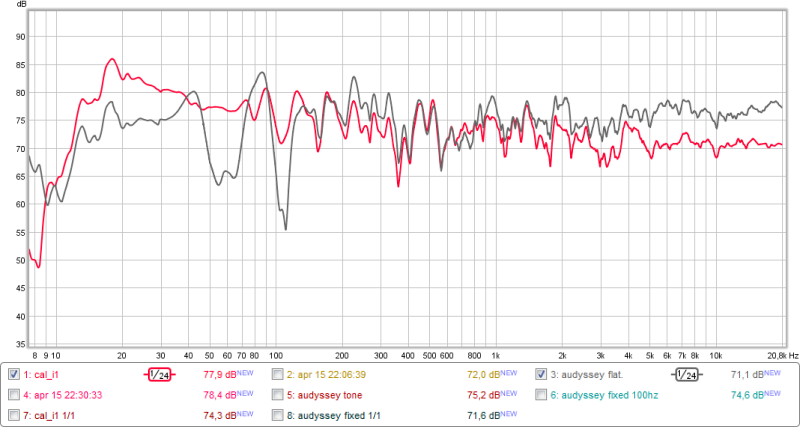 With no tone adjust the Audyssey Flat is equal to the grey curve above 1KHz. By using the tone controls it is possible to fix the tilt of the frequency response to match the around 3dB/decade fall, which will also give a flat on-axis response in this room with these speakers. The tone control in this AVR is implemented in the master volume control circuit, and this same chip is used in many, if not most, newer AVRs. This means the tone control works independent of the Audyssey processing, and it also happens to follow a nice tilting curve when adjusted. Adjusting bass to +1dB and treble to -5dB causes the curves to match, adjusted by observing the frequency response measurements. It is possible to adjust this by ear, using pink noise, and adjust until the tonal balance of the noise seems the same for no Audyssey and Audyssey with tone adjustment. 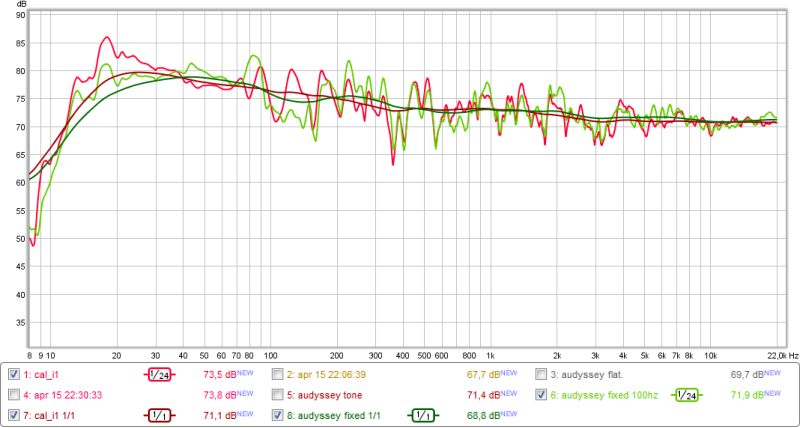 Now we can see that the tilt of the frequency response matches for both without and with Audyssey Flat enabled. The 1/1 smoothed curves show the averaged tilt of the reponses. This set-up should be re-calibrated to get the best possible response in the 80-200Hz range, by selection of crossover, distance adjustment and Audyssey recalibration. 1. Equalize the subwoofer system to flat using the subwoofer DSP. 2. Run Audyssey to calibrate. 3. Re-enable the house-curve on the subwoofer DSP. 3. Adjust crossover and distance for subwoofer to get the best possible response with Audyssey enabled. Thank you! You solved my Audyssey problems. I didn't know that adjusting tone settings (Bass, Treble) works so well with Audyssey Flat. It's funny .. I used the same settings (bass +1, treble -5) and result is excellent. Thanks for the very informative article. This might be the answer to my worries: audyssey making my speakers unbearably bright and harsh. However, I have a question. I cannot seem to adjust the tone controls on my receiver (marantz nr1602) with Dynamic EQ engaged. The tone control is greyed out. Is there any workaround to this? Hello, contact your dealer about this, if they can not help you, contact the manufacturer. Also note that this blog has moved to the new web site at www.kvalsvoll.com/blog/ .